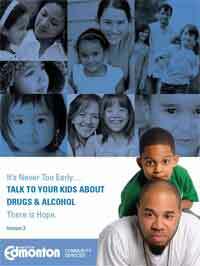 Developed with community input this unique resource helps parents talk to their kids about drugs and alcohol. What drugs look like, their street names and their effects. What to do if you find drugs. How to talk to your child about drugs and alcohol. A list of further available resources. A strong message to parents that there is hope if communication with children is maintained. Once you've had the opportunity to download and review our Parent Resource Toolkit, please take a moment to fill out a short, confidential survey to let us know how useful it is for you. Coaching kids to make positive choices.